Some experts estimate there are up to 25,000 tomato varieties to choose from. That can be overwhelming, even for the most enthusiastic home gardener. So many tomatoes – so little garden space! There are at least 3 different (and simple) ways to classify tomato varieties. Here you can see how tomatoes can be classified by their genetics, the time of length that they produce, and yes - even their shapes. This way you'll have a better understanding of this whole tomato variety business. You'll understand the terms (at least a bit.) You won't be so confused when you're at the garden center. And you'll have a better idea of how to choose varieties for your garden. If you want to know which varieties are most popular in the home garden, click here. And read on to learn about classifications. This classification centers on a tomato’s genetic line. Heirloom tomatoes are strains that have been reproduced for generations without cross-breeding. Hybrid tomatoes, on the other hand, are a cross between two different varieties. Hybrids are cultivated both commercially and in the home garden. This classification centers on the length of time a tomato produces fruit during season. A determinate tomato plant produces fruit for a couple of weeks and then production fades out. That’s because it eventually forms a flower cluster at the terminal growing point, which causes it to stop growing in height. An indeterminate tomato plant produces fruit throughout the season, often until frost. It never sets terminal flower clusters, but only lateral ones, and continues indefinitely to grow taller. This classification centers on a tomato’s shape. Looks count – even for tomatoes! 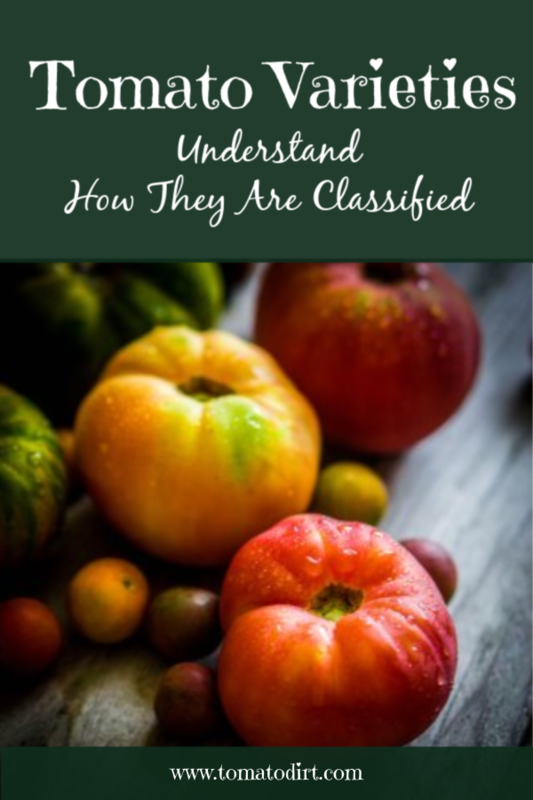 Whether a tomato is a hybrid or an heirloom, or determinate or indeterminate, it is also classified according to its shape. Have A Favorite Tomato Variety? Is there a tomato variety that you've had success with or that you like to grow? Share it with our readers. Tell us what it is, a little bit about the variety, and why you like this type of tomato. 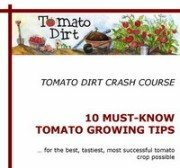 Enter a title, such as "Super Bigs give me 1 pound tomatoes all summer"
Your story will appear on a Web page in Tomato Dirt exactly the way you enter it here. You can wrap a word in square brackets to make it appear bold. For example [my story] would show as my story on the Web page containing your story.